“PlayStation Home (also marketed and referred to as Home) is a virtual 3D social gaming platform developed by Sony Computer Entertainment’s London Studio for the PlayStation 3 on the PlayStation Network. It is accessible on the PS3’s XMB. Membership is free and requires a PSN account. Home has been in development since early 2005 and started an open public beta test on December 11, 2008. Home allows users to create a custom avatar, which can be groomed realistically. Users can decorate their avatar’s personal apartment with default, bought, or won items. Users can travel throughout the Home world which is frequently updated by Sony and its partners. Public spaces are made for display, entertainment, advertising, or for networking. Home features many single and multi-player mini-games. Users can shop for or win new items to further customise their avatar or apartments. Home’s primary forms of advertising include spaces themselves, video screens, posters and mini-games. Home hosts a variety of special events which range from prize-giving events to entertaining events. Upon installation, users can choose how much hard disk space they wish to reserve for Home. Home is in third person and users can walk around in that way. Upon entering Home, users are greeted with the “Message of the Day” which contains Home news. During loading screens, users are presented with help tips about how to use Home, such as clicking L3 to open the Chat Log or that new items are marked with a star in the Wardrobe or Furniture browsers. 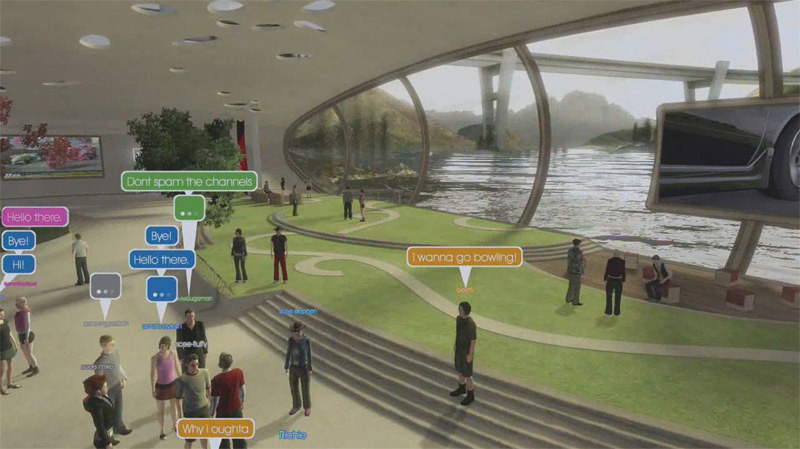 PlayStation Home has no on-screen interface during exploration, however, all of Home’s features are available from the controller. The options are; Quick Chat, a Gestures menu, the Menu Screen, the Safe Screen, and in-game XMB. In time, users will be able to play music on their PlayStation 3 hard drive. Whether this will be private or public will be determined by licensing issues that Sony is attempting to resolve. The “Menu Screen” (formerly the Menu Pad; and before that, a virtual PSP; pre-Open Beta) is laid out similar to the PS3’s XMB. There are seven categories including Navigator, Personal, Social, Wardrobe, Redecorate, Options, and Help (Redecorate can only be used in Personal Spaces or Clubhouses). The Menu Screen, under Personal, features an inventory, which has portable objects such as the “Bubble machine” as well as companions that follow the users around (e.g. a pet dog). Users can take screenshots of Home in either first or third person view with the camera and save them to their PS3’s HDD. With the use of Loot’s Active Duty Camera (premium item), users can also record videos in Home while in Personal Spaces or Clubs to be saved on their PS3. In time, some items may have a limited quantity before repurchase. The Personal category also lets users see their purchased items, rewards, downloads, and their PSN profile. The Social category lets users see their friends location, group activity, game launching events, the Message of the Day, and news. The “Safe Screen” is used for reporting, changing communication settings, and quick access to the user’s Personal Space and XMB friends list. The Navigator (formerly World Map) is also laid out like the XMB. It sorts locations into categories based on the space’s purpose (e.g. core spaces, or new and featured spaces or games). Users can communicate in a variety of ways in Home. Along with the existing PSN messaging system, users are able to write text messages to each other using either a physical or on-screen keyboard. These messages appear in speech bubbles over the avatar’s head and in the ‘chat log’. Users can switch between text chat and voice chat in the chat log. Voice chat, with the use of a headset, is available within personal spaces and/or clubs, or on private voice chat channels with groups of up to 8 users. The user can also perform visible gestures (or “e-motes”) such as waving, nodding or dancing. A ‘Quick chat’ feature, with predetermined phrases, is also available. Users can also indicate the emotional status of their avatar, which is displayed below their name. Some avatar costumes also have additional e-motes. Although the service itself can be used free of charge, premium content is available to purchase from various stores in the shopping complex and in certain spaces. Users browse and pay for items, such as virtual clothing and furniture, by accessing a shop and using its PlayStation Store interface. Items are paid for in real currency using funds from the user’s PlayStation Network Wallet. Alongside content designed by SCE, actual companies are also able to sell virtual goods through their own stores in Home. For example, Diesel, Ligne Roset, and Game are represented in Home with their own stores where users can purchase virtual items based on their companies’ own clothing and furniture designs respectively. Other brands and company’s are also represented. Advertising is prominent in Home’s public spaces. Currently, this is primarily PlayStation focused although other video gaming-related brands are also represented. Most advertising is targeted to specific regional audiences. In a future update, the full PlayStation Store will become accessible through Home, along with virtual TV, radio and media playback. So Playstation home is similar in some ways of Sl even they have 21.000.000 registered users. So for those SL users that have a playstation 3, now you know that there is another virtualworld to visit!. This entry was posted in Start and tagged Playstation Home, Virtual World for Playstation User, Virtual World in Video Games. on November 4, 2012 by Xpontaneus.